UltraBac Virtual Disk is a stand alone utility that can create a native VMware ESX Virtual Machine Disk (VMDK) file or Microsoft Virtual Hard Disk (VHD) file. Whenever the utility is run, whether on a scheduled or ad hoc basis, it can create or update a VMware or Microsoft virtual disk file. This completely eliminates the conversion typically required for a physical-to-virtual (P2V) operation, and automates the process of creating and updating standby virtual machines. Users can perform a physical-to-virtual operation in less than three minutes after a backup completes. For fast disaster recoveries simply attach the VMDK or VHD and boot. 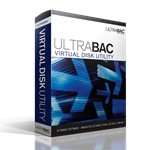 For a more comprehensive overview, please view the UltraBac Virtual Disk Utility Product Sheet.